Thirsties Wipes are now added to SentuhanBayu Online Store. Thirties wipes kini ada di SentuhanBayu Online Store . Tengoklah gambar dibawah ni untuk lihat produk dgn lebih dekat. Untuk pembelian, sila klik sini. Thirsties Fab Wipes will save you money. The average household will spend about $800* in wipes from birth to potty. Switching to washable baby wipes, is a simple solution to put money back in your pocket. In addition, Thirsties Fab Wipes are perfect for delicate baby skin as you’ll be able to control the solution you want to use to cleanse your baby. 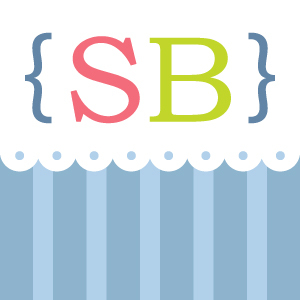 Reusable cloth baby wipes are an alternative for both disposable diaper wipes and can also be used for wiping up little baby noses, hands, and messes. We keep a stack of about 100 of them on hand that we rotate through to suit a whole variety of needs. In addition to cleaning diaper changes, we also use ours as little burpies, quick wipe-ups after mealtime, and I even keep a stash of my own for refreshing facial wipes and make-up removal. They are so soft and irresistable. 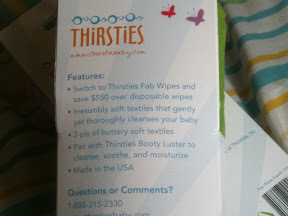 Thirsties Fab Wipes measure 8x8 inches and are 2 ply. A textured cotton velour on one side to assist with bigger wipe-ups and delicate microfleece on the other side for drying or for lighter messes. These wipes will fold and fit perfectly in a recycled wipes container or warmer, but we like to stack ours and display the colorful selection in a basket above our changing table. 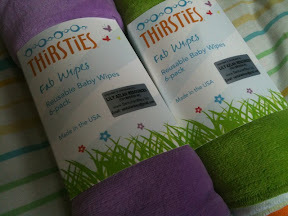 Thirsties Fab Wipes can be used with plain water or with your own wash solution. You can choose to dip your wipe in a solution and then use on baby, or you can choose to store a solution in spray bottle and mist your baby's bum then wipe clean with a wipe. Comes in packs of 6 in an assortment of colors. Machine wash warm or hot. Dry on low. Made in the USA. *Based on average 3 containers of wipes a week at $2.50 a box.